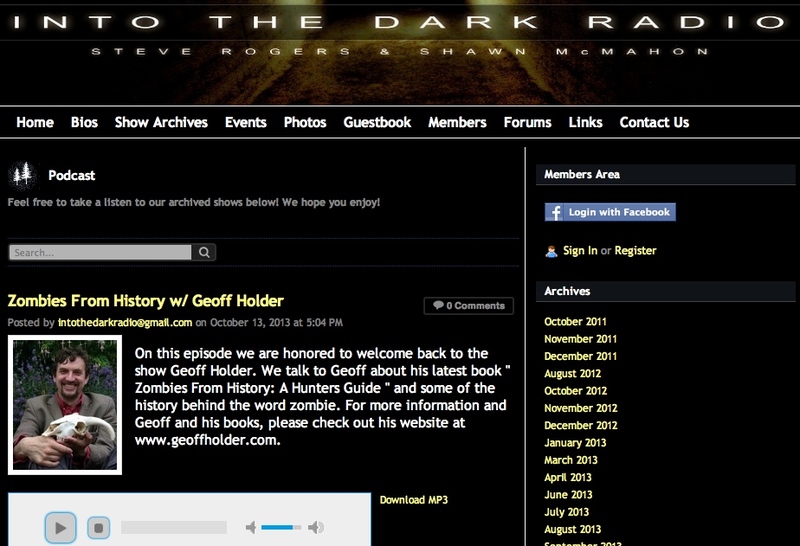 It is on Into the Dark Radio, www.intothedarkradio.net/apps/podcast/311740. 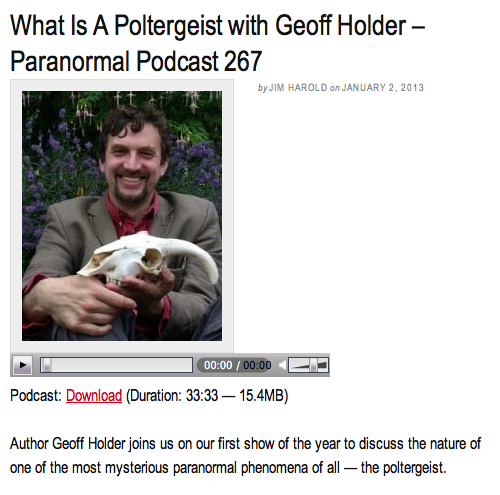 It is about poltergeists. Some of them from Scotland. 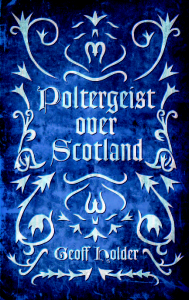 There is also wittering about poltergeists from the USA, Canada, France and other locations. Vampires, demons, witches, fairies, thoughtforms and psychokinesis get a look-in. Occasionally, jokes are made. One or two of them may even pass for being funny. Into the Dark Radio is based in Ohio, yet can be heard and downloaded across the known world thanks to the miracle of the thing that all the cool kids are calling ‘the internet’. Ta to Steve Rogers and Shawn McMahon for allowing me to maunder on. Follow them on that there Twitter, @IntoTheDrkRadio. 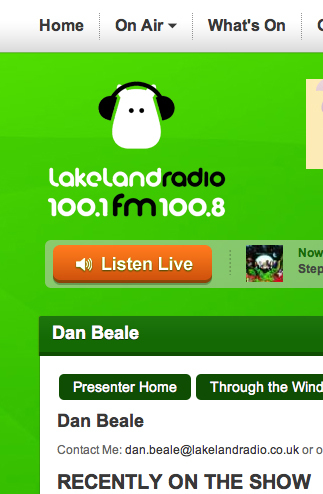 This entry was posted in Uncategorized and tagged dark radio, geoff holder, poltergeists, radio on 22/07/2013 by Jamie Cook. 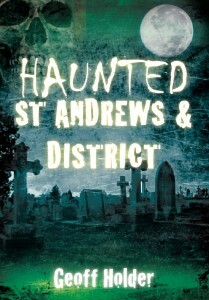 On Wednesday 20 June I was interviewed on Dundee radio station Wave 102FM about Haunted St Andrews, which will be published on 29 June. The White Lady and the mummies of the Haunted Tower got an airing, which is nice, along with several other posh ghosts. 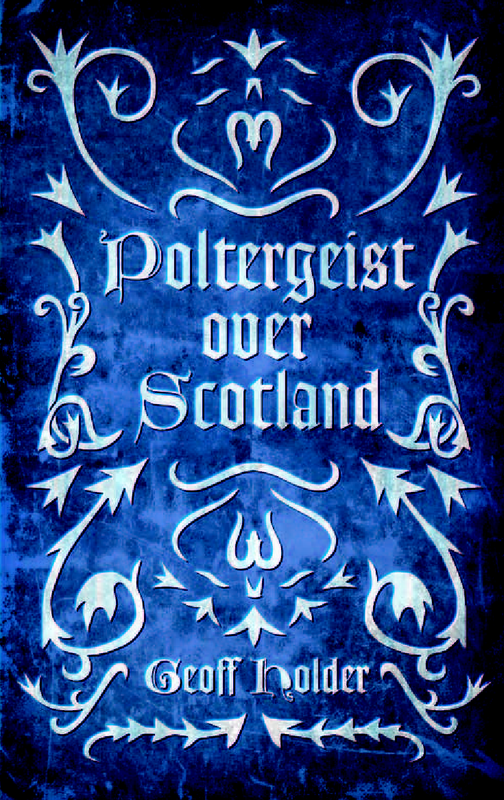 More events (book signings and talks) and media appearances (newspaper features) are on their way soon regarding Haunted St Andrews, so keep a weather eye out. This entry was posted in Book releases and tagged Dundee, geoff holder, haunted st andrews, haunted tower, interview, mummies, radio, the white lady, wave 102 on 25/06/2012 by Jamie Cook.